We begin this season with an opening shot of a young Claire Underwood, a character who, through the years has been dragged through the mud by its own producers. Quickly the Oval Office is in view. “It’s been that way since Francis died.” Just one minute in and we’re off to the races in the Claire-era. 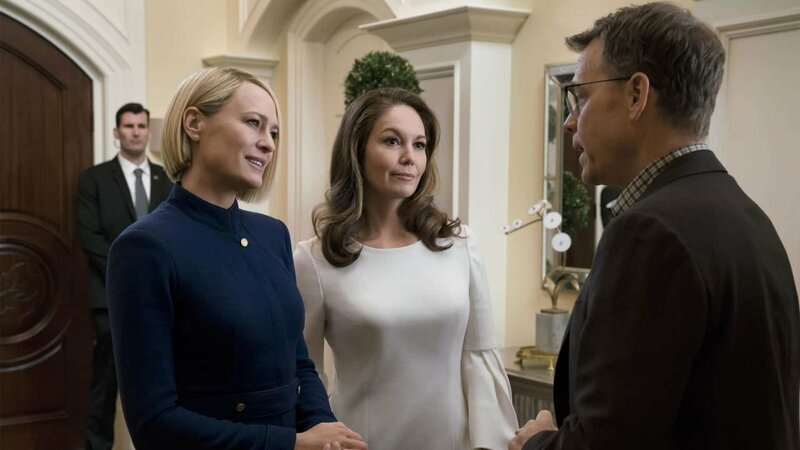 Make no mistake though House of Cards is ostensibly the same show merely built around a strong lead (Robin Wright), which in recent years hasn’t worked in its favour. Robin Wright has always had a confidence about her playing Claire from minute one. There are some great scenes right out of the gate where she walks the once hallowed halls alone, pondering what to do next. Some of her time is spent undoing the legacy of Frank Underwood, and by proxy, Spacey. “Francis, I’m done with you” she exclaims in a surrealistic scene. That’s 10 minutes in. House of Cards seems to move on quick. Until it mentions him again 10 minutes later in another fourth wall breaking “do you miss him yet” aside from Claire. “No,” I reply. I’m ready for this new chapter. Then again at the end we get one final (?) hurrah with a Frank totem and a telling flashback. Sort of. It’s weird. 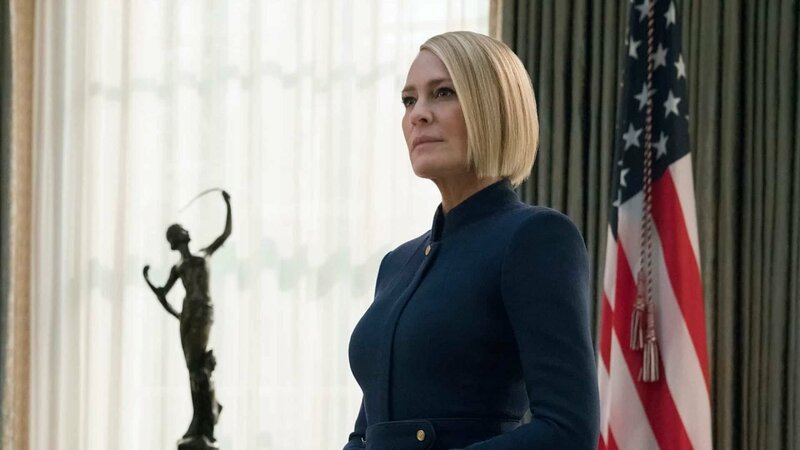 House of Cards’ team seems unable to move on from Frank, but we know that this is the last truncated season with limited time for Robin Wright to shine. For those of you who were hoping that the show wouldn’t completely erase Spacey’s legacy, you have your wish. That isn’t to say that there aren’t new plotlines quickly put into motion: as Claire’s presidency is a radical tonal shift in its own right. In a way clearing the air allows all of the cast to sort of free themselves from both the meta-Elephant in the Room and Frank the character. Underwood confidant Doug is reticent on casting him aside, clinging to the past, but ultimately able to live for himself for the first time in years. We ostensibly learn more about our players through their reaction and the passing of time. 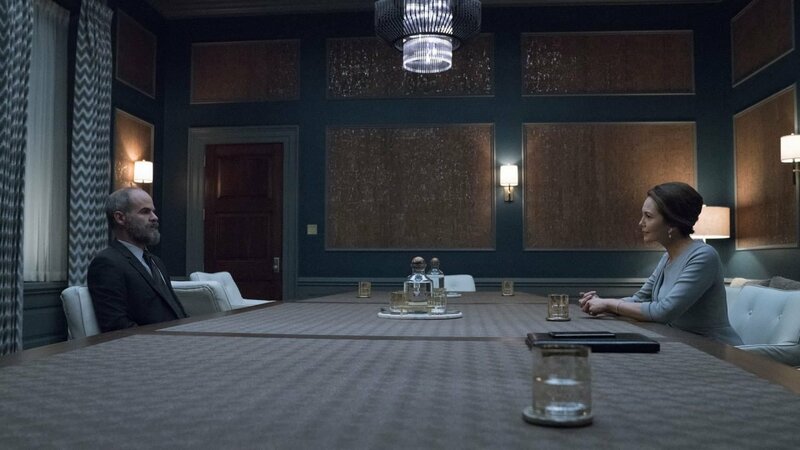 It’s a medley of character study and soap opera twists that is frankly par for the course for House of Cards. But enough about Frank (though it is the lingering question on everyone’s mind): this is Claire’s finale. She has her own demons to deal with and a new nemesis, which, in true House of Cards fashion, is cartoonishly garish. Greg Kinnear has played his share of Good Dads but he’s also taken several shots at villains. He’s fairly versatile but he does not work as a formidable foil here. To the show’s credit a lot of the fat has been trimmed. Claire’s lengthy fling with Thomas Yates was cleaned up last season and is addressed. Will Conway, the man who almost pushed the Underwoods out of the White House is out of the picture. In its place: more superfluous storylines that may or may not be completely wrapped up by the time the show ends. After witnessing this final season I’m not sure that anyone on the production team wants to actually give fans a satisfying end. After the show went off the rails in season two that train car has been barreling down the tracks, with nary a care for anyone it hits along the way. 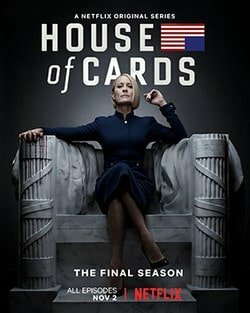 I adore surrealism and abstract plotlines, even in similarly politically-centric storylines, but House of Cards is just all over the place. Netflix provided us five episodes (of eight) for this assessment and I’m not sure what else could happen to turn this franchise around from its current state of a hair above mediocrity. Robin Wright plays Claire to aplomb and was always a capable lead. Maybe the shift should have happened sooner? We may never know. 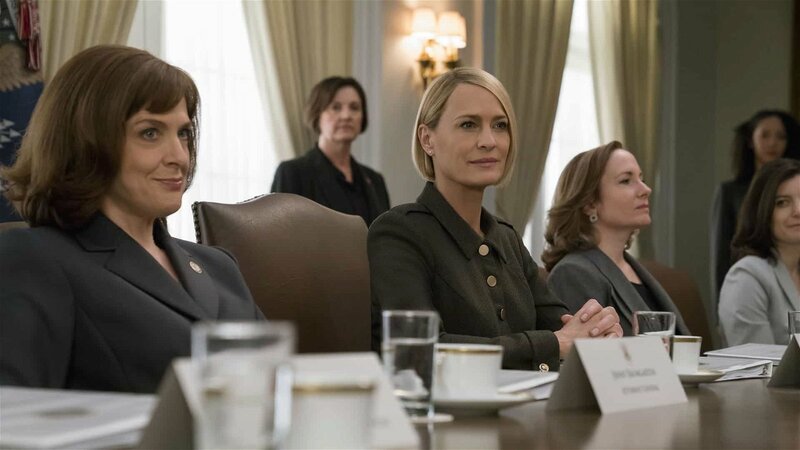 The shift to Claire works in House of Card’s favor, but the soap opera antics and sense of self-importance continue to its detriment.